Cooking roasted asparagus is yet another “set it and forget it” recipe. You turn on the oven and you’re practically done. This is only one of many ways to cook asparagus, but it’s probably the best. Asparagus. How to asparagus? With asparagus. This word has started looking ridiculous. You’ll also need olive oil and chopped garlic. And optionally, sea salt and a proper pepper grinder. Before you start, begin preheating your oven to 400 degrees. This isn’t going to take long. 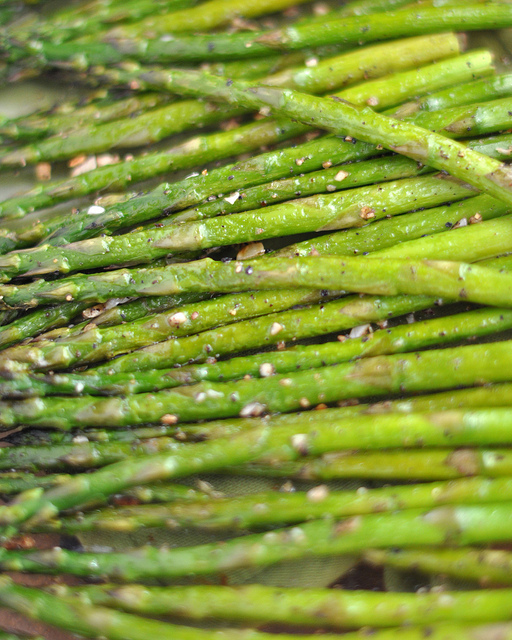 Wash your asparagus spears and remove and “stick” type pieces. Chop up a few garlic cloves, as well. Drizzle a baking pan with a thin coating of olive oil. Toss the cleaned asparagus in a bowl with olive oil. Spread them out evenly on the oiled baking pan and sprinkle with sea salt and freshly ground pepper. Add your freshly chopped garlic. Bake in the oven for twelve to fifteen minutes, depending on how well done you prefer your asparagus to be. Once plated, drizzle with a bit of juice from a lime or lemon and some parmesan cheese. This gives you much more flavor and makes the whole thing seem awesome. After cooking your asparagus, wrap several pieces in a bacon weave and bake until the bacon is cooked. You will end up with something incredibly greasy and surprisingly amazing that you can serve sliced. Or for a more obvious option, make it a complete meal by pairing your asparagus with some garlic chicken and rosemary baked potatoes. For additional ways to cook asparagus (and many other things) sign up for our free weekly newsletter.